Natasha says the boss has gone on HIATUS and will only be back on September 11th and it is timely that we posts this article from our fellow blogger as this article has some interesting facts to ponder on especially Sarawak Political Affairs. It has been five boring years since I was being paid three months salary to go on leave forever by the Sarawak Tribune. Based on the sacking letter the management was saying this was according to the agreed term that we can part company by paying each other three months wages. However, when I met Datuk Seri Mohd Asfia Awang Nassar slightly earlier than that I was told that I have to be sacked because of my tendency to meddle in Sarawak succession issues. Hmmmm hmmm hmmm. My largest sin according to Asfia was for openly supporting Datuk Amar Abang Johari liutenant, Ibrahim Baki in the race to become Petra Jaya MP. Asfia said he fully understood my support for Johari because of my Kuching roots, ha ha ha. Mak kau tu’au Belawai lah pok! Apak kau tu’au Ajang! A former YB of my Kampung not knowing my family roots, he must be sick. My uncle is now a certain MP pol sec, true blue grassroot Gurkha, pity Asfia – typical of a parachutist that think too highly of their paper credentials. That “3/4″ advisor eventually climb Pesaka Bumiputra Bersatu (PBB) hierarchy at lightning speed right after that, of course much more higher than Asfia himself, surely at the chagrin of pure Malays who are much more senior than him. We cannot blame the advisor because he and Abang Johari sharing a common trait, liked and accepted by people from all walks of life, regardless of race or religion. Unlike some arrogant, fake pretenders of PBB who have forgotten that their election victory are purely courtesy of Barisan Nasional (BN) ticket and help from the Chief Minister during campaigning period. Come the next election, let wait and see, the people eyes are wide open now and they knew BN are not indispensable. Illiterate parents are blessed with educated children and oppositions are slowly adopting BN strategy, translating support into vote. Those in BN who are still dreaming must remember that Datuk Alfred Yap once said that he can win without Malays votes, and he successfully dig his own political grave. With the curent H1N1 outbreak and bad weather, Yap can always put on a haze mask and try asking what the Malays have to say about him? Look at SK Haji Baki, the Malays majority school that is still sporting 1965 pre independence like building. Datuk Yong Khoon Seng vehicle too are rarely being sighted at Kampung Semaba now after winning by a whisker against DAP. I have seen Chief Minister blue eyed boys came and go. Names like Datuk Dr Seri Effendi Norwawi, Datuk Wahab Dollah, Haji Bolhassan Di and many more would surely came to mind, but where are they now? Oh my god, I forgot about Datuk Seri Adenan Satem, is he still alive and alright? 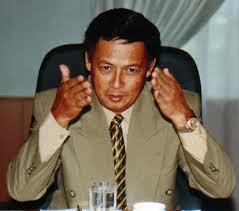 He was once rumoured to be Taib successor. I was on so many occasion being tasked to spin great stories about Adenan but more than often would never get the desired level of co-operation. Partly because we never have that chemistry. My friends who can cope cocky species, having patience to wait for hours, and wasting time writing caption moronic report, does not have problem dealing with Adenan, not me. Adenan, Wahab and Bolhassan obviously sharing same quality, they are very intelligent people. However in politic being intelligent alone is not enough, you have to be smart. Sadly, in my personal opinion all three are simply not smart enough. Bolhassan attitude changed him from the most popular supreme council member to an overnight party poll loser. There no need for me to elaborate about Adenan and Wahab, people knew. Wahab used to be my employer “owner”, Bolhassan my boss “Best Friend” while Adenan “most important VIP” but all three have disappeared into thin air. There are simply too many other names, and majority are choosing to blame conspiracy for their failure to get the spot in the press. Probably, they must hire me to bring a tape recorder in my pocket and start listening to what the rakyat have to say about them, what the average reporters have to think about them and what their grassroots leaders have to tell the press. I can do that at RM5,000 per month. In politic, respect is earned until you become the most powerful guy. I criticise Datuk Daud Abdul Rahman like hell over the Muslim graveyard issues in Mile 3. He still smiles to me and shake my hand instead of cursing or hurling abuses to me. I write very nasty remarks about Abang Johari at the height of the previous state election, he still shake my hand and smile to me. Same thing Dr Abdul Rauf, Wan Junaidi and few others. We still have certain level of respect for each other although we are not friends like what we used to be. I have never read any report on Wanita PBB activities in the media. May be partly because I no longer subscribe to PBB linked Eastern Times and Utusan Sarawak. When I was working for NST (stringer), Bernama and Sarawak Tribune, getting comments from Hajah Fatimah the deputy PBB Wanita chief was the easiest thing to do. When I was tasked to publish a Wanita magazine, trying to meet her is much more difficult than that of meeting a super senior Minister 20 years her senior. How people changed! Ironically, majority of the PBB Wanita are now working on their own. Fatimah going to the left with her Ministry roles, Hasidah going to the right over her constituency function, while Nancy Shukri busy with her so-called Parliamentarian capacity. By the way, who is the Wanita chief? Is PBB wanita headless or what? To me this is only supposed to happen to an organisation led by the so called barely-educated-project driven grassroot politician. That was not to be. Sadly, more and more parachutist are landing in PBB and creating what my friend described as “Pemimpin yang perlu dipimpin”. It is not only in PBB though, Parti Keadilan Rakyat (PKR) much worst than that, I will write about their anti instutition leadership at some other time. I have heard about so-called PBB youth leaders rarely attending meeting, overheard about youth leaders openly requesting for project during meeting, and many more. Its sad to hear this kind of accusation about PBB flying around, I hope they are plain rumours. If they are indeed true, PBB must start doing something and goes back to the basic. Do not wait much longer, do the spring cleaning and get rid of some of the deadwood that spell very negative connotation! This year is also supposed to be an election year for two Dayak majority or so-called Dayak-based political party, Parti Rakyat Sarawak (PRS) and Sarawak Progressive Democratic Party (SPDP). I have almost lost track of Dayak politic. In the early 2000, Dayak politic was literally my game. I followed the Sarawak National Party (SNAP) crisis from day one. It was triggered by the sacking of Datuk Tiong King Sing. This year, Tiong is also carving a name for himself in SPDP and most likely would vie for deputy presidency. Tiong trusted friend called me the other day optimistic that SPDP deputy president, Datuk Peter Nyarok would be giving way. I hope Tiong will not reveal his generosity to Nyarok in public the way he did about Malaysia Chinese Association (MCA) president that earned him MACC attention, here. Mawan, the most intelligent Dayak leader and very smart too, had given the greenlight for a contest in SPDP, for all position out of democracy spirit. I know deep in his heart, Mawan is praying that Tiong would not changed mind or strike a deal with Nyarok to oust him, ha ha ha. Over in PRS, talks about Datuk Seri Dr James Masing will be challenged by Datuk Joseph Entulu had silent down. Though the two extreme outside PRS are obviously showing comfort that Entulu is making his displeasure toward Masing publicly on differing background. Some are hoping that Masing would be ousted so that those kicked out from the party during the recent spat can be brought back and maintained their respective status quo in the Sarawak state Cabinet. Majority of those kick out, however have openly joined PKR or DAP bandwagon, except Larry Sng, my ex FB friend. The other extreme are hoping that Masing would be challenged so that Entulu would be able to put brake on Joseph Salang political carrier. It was widely speculated that Masing proposed Salang name ahead of Entulu to become Federal cabinet minister. Salang presence in PRS is a threat to some, partly because of his “independent” financial status or political world view. In fact, Salang and Masing were the original “successors” groomed by Tan Sri Leo Moggie. That what Salang often told me, but politic would always be tricky and full of uncertainty. The dull Sarawak political landscape was once again alive with the arrival of Datuk Seri Anwar Ibrahim and the Ibans from Kuala Lumpur. Anwar was never tired of saying that Pakatan Rakyat would be taking over Sarawak government in the next State election. I would love to see that happening. Anwar, however, is far from having the right team to realise his dream. He got very good Chinese leaders to help him in Sarawak, but they are not from his own party. PKR chinese leaders could throw a party if they do not lose their deposit in the next election, honestly. Dominique Ng included. I hoped DAP and PKR would square off in Padungan to teach Dominique a lesson that his victory was not about him or PKR, but the public dissatisfaction to the government of the day. Anwar success in Dayak area would be depending very much on the support that he got from his Kuala Lumpur-based Ibans. These young Ibans from Kuala Lumpur would be playing very important role. Not his existing Iban leaders that have long overstay their welcome in politics. The so-called Kuala Lumpur Ibans, however are of mixed background as well that Anwar have to do his homework very carefully before trusting or simply fielding the so called champion that stand out. Some of these highly decorated are actually nothing more than pretenders themselves. There is one who blogs highly about his business acument and parenting skills, but is nothing more than a PBB rejects who failed both his business and family life. A seasoned writer, who was formerly based in UK once told me that Sarawak is actually a State with the highest percentage of PhD holder per capita, and Pakatan Rakyat is probably blessed with half of them, majority specialising in alternative medicine. The once footballing Bintangor clinic dresser turned Doctor included but he would be joining BN soon, not vice versa. Anwar must not waste his time and effort in Malays area because his anti instistution Band of Samseng Kampung will not bring PKR anywhere. They can deny it but for how long? I fully agree that politician have to utilise all kind of supporters but naming one such personality as a top leader like what Anwar did before was far from right. Looking at what is happening in Penang, I am sure the Rakyat knew that there is nothing wrong with having a Malacca guy as Chief Minister, at least among the Kampung Buah Pala folks.